First batch of Mantis are now shipping to the shops at an introduction price of $335 fully loaded with power. Its interesting, but I'm not sure I would want to buy a plastic case. I'll bet half of us on here started with a happy ending kit (i did). That's barely twice the cost and no connector cables hanging out the back. They should sell a ton of these. 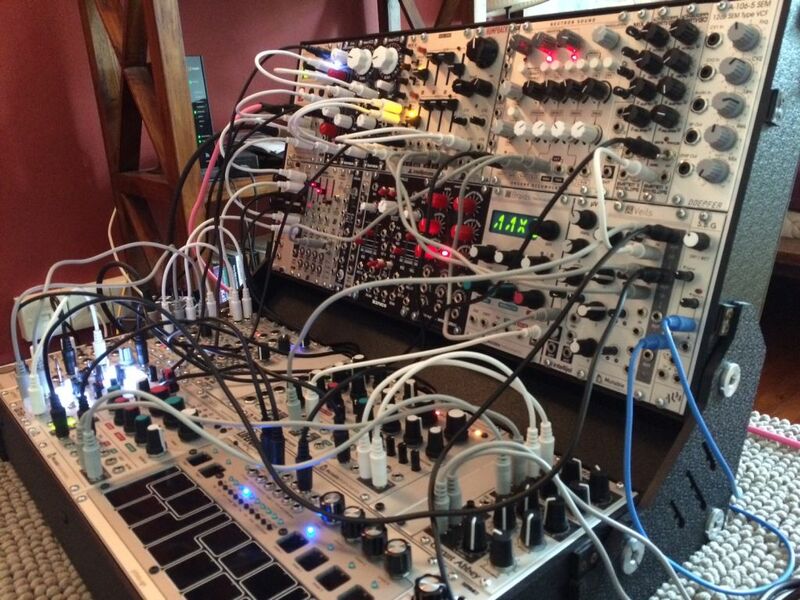 It is kind of unique in the modular world as far as I know, but when you think about it so many other things have plastic cases: drum machines, keyboards, etc. Why not a modular case? Seemingly it makes for a nice price point. Yeah, good price and looks nice! I'm guessing there isn't much in the way of cases like this because injection molding is probably expensive if you aren't making large quantities, because the design phase and setup cost are likely high. The modular market is probably big enough now though that a large company like Tip Top could safely invest in something like this and commit to having enough made where it will be profitable for them. Once you've tried plastic, you won't go back . My 12U Amalgamod is an easy carry because its plastic. That TipTop might make a nice expansion case, and at that price I'm not afraid to paint it! I guess the plastic legs are what make me second guess it. All that said, I might get it anyway because of the price point. I would be more interested if the plastic was textured (such as the one above). As far as other plastic gear, if metal/wood were available I would often choose those instead. Seeing this, I'm so glad I didn't follow the advice I got everywhere to get a 9U for more money than the Mantis. I went on the (relative) cheap and filled a HEK and picked up a Mother-32 which has given me plenty to explore, and this comes at the right time for me to grab one now that I know I want to continue with eurorack but will need to upgrade on a limited budget. One thing I noted-they mention portability, but is there any kind of a lid? I can't imagine moving this around without some panel protection. Edit: also, just want to say that I wish there was a way to connect multiple units together to make the whole thing a bit more...well, modular, frankly. That's really been one of my biggest complaints when trying to plan future modular growth because I feel like I should have case options that reflect the needs I will have with customizing my instrument. It's a minor niggle here, but TipTop are probably in a better spot to adapt based on market needs, so hopefully this is noted. That's nice, beautiful, light and inexpensive. I just wonder how to travel with this. No lid. Knobs on the surface. For the studio, it seems really good, nice looking and cheap. I thought I remembered them mentioning some sort of lid in one of the trade show videos, but nothing announced formally yet. Obviously, TipTop themselves have already been traveling with these, so they must have some suggestion for protecting the modules during transit. Pity there´s no option in Black, but looks good. As it is, It is no different than transporting a keyboard, needs a case/bag. I believe there's some kind of bag in the works. Really like the look of the case. I'm curious to know what the price will be in the UK. Nice, I've been looking for a 6u 104hp case with power. My current 9u 84hp case is WAY too heavy. I swear the box weighs more then the modules. Now if Mantis would be available in a black body, with some kind of lid I'd be so very sold. How about a hinge/adaptor to close 2 mantis cases into one enclosed case with one central handle? glad someone is making an affordable case. the white curvy body is not really my thing, but hopefully this will make the market price go down a little for all future cases?